Goats, the other “fur babies” on our ranch! We knew when we bought the ranch that we wanted to include a couple of goats to our array of pets, since we have loved their spirited and curious personalities for years! We chose to get Dixie and Dolly, our Pygmy Goats, because these little loves are basically like having another dog. They are small, easy to take care of, and have been a fun addition to the Wildflowers Ranch pet crew! 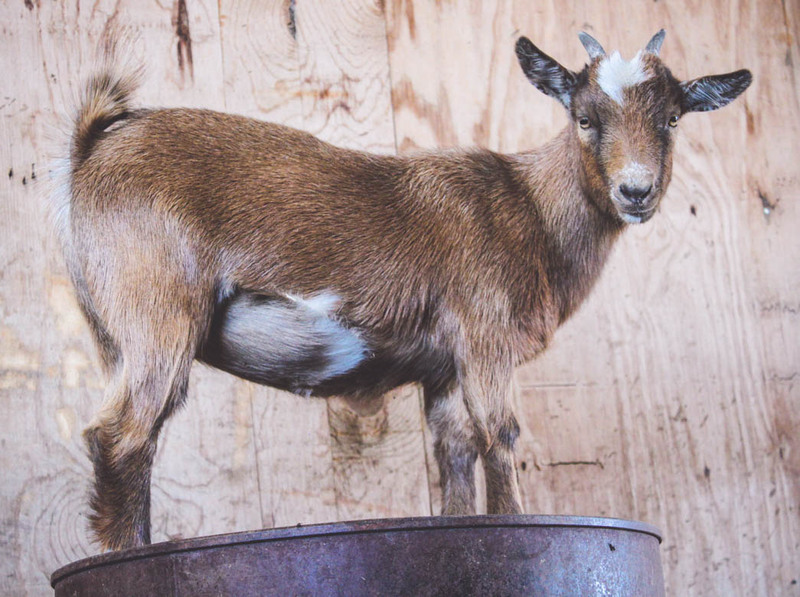 Before adding goats to your farm here are a few facts and tips for raising goats! 1. They are simple and easy to take care of! Just like with most other animals, you need to feed and water them morning and night. They love being able to run around in the fields and go on adventures, but make sure they have shelter at night to keep safe from predators. Other than that, just give them lots of love and treat them like a member of your family. They enjoy following us all around the property, and even sneak into our garage from time to time! 2. Like most farm animals, goats have secondary functions other than just being pets. Every spring the weeds in our pastures grow tall and need to be trimmed down. Our goats are our “weed-abators,” and happily gobble up most of our weeds! They are our natural and lazy solution to mowing the pastures constantly, which makes life a bit easier. They get happy bellies from eating the fresh grass, and we get to save a bit of money on food. 3. The rumors are true, they will eat just about anything! From the weeds in our pastures to my sister in-laws potted succulents, (sorry Heather! ), to our door mats, they will munch on anything that seems like it might be tasty. They actually prefer trees and shrubs to grass, but if they can’t get their preferred meal, they will make do with whatever is around. 4. They are escape artists! This summer I received a phone call from my neighbor, apparently Dixie and Dolly were in her yard trying to eat her ripe tomatoes! They had been in a fenced in part of our stables, yet found a way to sneak out and wander on over to her garden. It took us about 45 minutes to get those little stinkers back into our yard, they were so excited to be out causing mischief. That day, I also learned a valuable lesson in how to carry goats. Horns to the face are no joke! Carry them with their heads (and horns) under an arm and behind you. 5. Goat playgrounds or obstacle courses are highly recommended! We moved some barrels into their stables when they first arrived at the ranch, and quickly found out how much they love to jump and play. They are so fun to watch, that we are planning on creating a larger obstacle course for them to play on, stay tuned for funny videos! 6. Goats have a pretty solid jumping range and can also climb high, which again lends itself to loving obstacle courses! My family had goats when I was a kid (pun possibly intended…) and we learned about the jumping when we awoke one morning to our goats sleeping on the hood of my mom’s brand new car. Hilarious to see, but not so hilarious for the dented hood! 7. They poop constantly! I never realized how much two little goats could poop! I guess a positive is if poop could ever be considered “cute”, its goat poop. They leave little pellet poops all over the dang place. I guess you can look at it like free fertilizer, so maybe that should go on the “pro” column, but still. It’s poop! 8. Girl goats, “does,” are easier than “bucks,” or boy goats. Bucks have a strong and distinctive odor, which most people consider to stink. Bucks will also urinate on their front legs and faces when they are in heat, which is just something I didn’t want to deal with. Bucks need to be separated from the does so you can take control over breeding and prenatal care, which is important. For us, it just was easier to get two sweet little girls, and we are happy with that decision, since taking on bucks presents a whole different set of challenges. 9. They get along with everyone and prefer to be in pairs. They are generally curious about other animals, unless, of course, they feel scared. Our Boston Terrier, Gemma, likes to chase them from time to time and I think they secretly enjoy outrunning her. We have not had to worry about them bothering the chickens, barn cats, or horse because they are so friendly. Make sure to not have a lonely goat, or you will hear them hollering for you to come visit them! They are very social animals and enjoy constant companionship.